If you've heard the term "check card," you might be curious about its definition. It may sound familiar, but is a check card what you think it is? Learn the meaning of this term as well as the pros and cons of check cards with this review. Also known as debit cards, check cards are a type of payment card that draws against your checking account. In other words, when you use your check card, the funds for the purchase come directly out of your checking account. Think of check cards as the plastic version of a check, only they're more convenient to use and widely accepted. While a number of business establishments don't take checks, businesses overwhelmingly accept check cards or debit cards. The companies that typically don't take debit cards are the same ones that wouldn't take credit cards either. Most commonly, these places are cash-only establishments and seek to avoid the fees merchants must pay to use debit and credit cards. Check card payments can often be processed as "debit" or "credit" transactions, so when you're at the store counter ready to buy, say, your groceries or a new pair of shoes, you might be asked how you'd like to pay: credit or debit. For most individuals, either option won't pose any harm, though debits will be processed quicker than credit charges. That's because if you decide to make the purchase using your check card as a debit, you'll be asked to enter your personal identification number (PIN) and the funds will be drawn immediately. On the other hand, a credit charge will typically be in "pending" status in your account until the payment posts a day or so later. If you're wary about your PIN being stolen or compromised in some way, you might want to use your check card with the credit option. 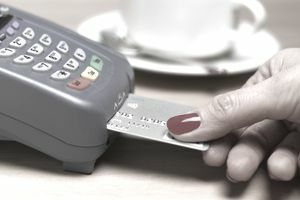 In this scenario, the merchant will slide your card through the card reader, or swiper, and you will be prompted to sign for the purchase, just as you would when making a credit card purchase. But the funds would still be debited directly from your checking account, hence, the name "check card." Some consumers believe that using your check card as a credit card is the safer option because it prevents others from accessing your PIN. Because check cards, or debit cards, withdraw funds directly from your checking account, they come with risks. For example, if a check card is stolen, the thief will be taking your actual money. It isn't the case if a credit card gets stolen. Also, many places, including hotels, car rental companies, and gas stations, may place a hold on your account when you use your debit card to make a purchase. It could lead you to overdraw your account if you didn't know about the hold. Say you purchased gas for $35, but unbeknownst to you, the gas station placed a hold on your account for $100 to ensure that it would receive payment for the transaction. If you only had $200 in your account at that time and an $85 check cleared your account, your account would be overdrawn by $20. It could lead to fines and fees that would put your account in the red even more. As a result of this possibility, many financial experts advise against using check cards at gas stations, hotels and other establishments that commonly place holds on checking accounts when a purchase is made via debit card.